He told BBC World Service's World Football programme that he was saved from looking after cars on the Santa Cruz streets when the founder of the academy invited him to train for free. "Of my friends, many who used to play sports and go to school are now living on the streets, taking drugs, they are drunks, they don't study, and they have left home," he said. "I have the same dream that everyone has here - that I could go and play abroad, represent the Bolivian team and also play in Europe." Many of the children at Tahuichi wear T-shirts with the legend, "sport yes, drugs no." It serves as a reminder of the fate that could have otherwise awaited them in a country, which is one of the world's biggest producers of cocaine. Academy president is Roly Aguilera said that Tahuichi teaches the children to be better people, but also to believe in themselves. "Sport - in this case, soccer - is the best mechanism to prevent children becoming addicted to drugs and falling into alcoholism and prostitution," he said. "We take these children out of the streets, where they normally wouldn't have much to do, and we give them self-esteem. "Tahuichi gives the youth a sense that if they sacrifice themselves training, they can become and will become champions. We have proven it." 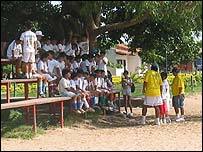 Since Tahuichi was founded over 25 years ago, it has won 95 international tournaments, and trained some of Bolivia's most famous football players. 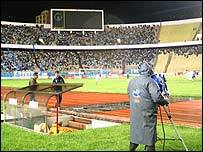 "Bolivia had never won anything," Mr Aguilera said. "We have lost all our wars. Politically, we are a chaos and undeveloped country. Then out of the blue, these kids come and are number one - ahead of Independiente de l'Argentina and Palmeras of Brazil. "That was such a message to the Bolivian people." Tahuichi has changed the lives of thousands of other young Bolivians - but for that to continue, money is desperately needed. Because of its success, Tahuichi has grown beyond all expectation, and now has over 3,000 children every month. Most of those who come to the academy barely have enough money to pay for their transport, let alone their training. A handful of the poorest children from distant cities in Bolivia live at Tahuichi - where everything is paid for - while another group get food supplements to help them fight the malnutrition that is rife here. Meanwhile, Tahuichi has sponsored some of the most promising students at foreign universities. Money does come through sponsors - different institutions and companies in Bolivia, as well as international help through the Andean Corp that finances the women's soccer. "We have what we call our Robin Hood effect," said Aguilera. 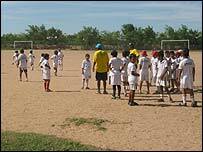 "Every year, Tahuichi promotes, on average, four or five children to the professional soccer league - and through these transfers, help the three thousand children come to Tahuichi. "We do a job that should be done by the government - and we don't receive help from the government. "We've received prizes from the government. We've received the maximum condecoration that the Bolivian government gives out to any person our institution. "But with medals we don't survive."